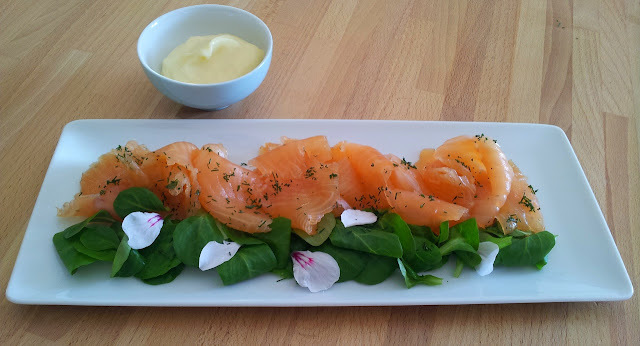 A Normandy Kitchen: Gravlax of salmon. My food and life in Normandy! This is something that we love to eat, hence something I make a lot. The base stays the same, but you can change a few ingredients to make it a bit different each time. Also the sauces and dressings can make a big change - so we do not get tired of it! How I make it is a little different as I buy a whole fish, fillet it, bone it and also skin it (I find skinning the fish speeds up the salting process by having both sides exposed. This way, I use less salt and avoid scaling, which is always such a messy job). It goes without saying that you have to use the freshest fish you can find. Into a thick zip-lock bag, I place the fillets together and fold over in half. It is good to weight it, but I don't always and it still comes out fine. As a rule, after 48 hours maximum , (24 - 36 hours being better as the skin has been removed). Take the fish out of the bag and pour away any liquid, wipe off the excess herbs and any salt (you can rinse the fish if it was very salty, but there should be no need). You can re-herb it if you like with a little more fresh dill chopped finely. Re-wrap the salmon until you need it. I use it over two weekends which is about 10 days. Slice before serving with a serrated or very sharp knife (cut across the grain in a slow up and down motion don't try to push your knife, I cut mine as if it was in three sections. Sauces could be anything from lime mayonnaise with grape-seed oil to honey and grainy mustard or sour cream with dill. I have also used Greek yoghurt and crushed caraway seed and even, home-made chilli and tomato jam goes well. Tomato and spaghetti of courgette salad. Smoked haddock and spinach lasagna. John Dory and black lentils with a cider cream sauce. Sumac Roasted Chicken and Couscous.